Addicted to adventure and the mountains? 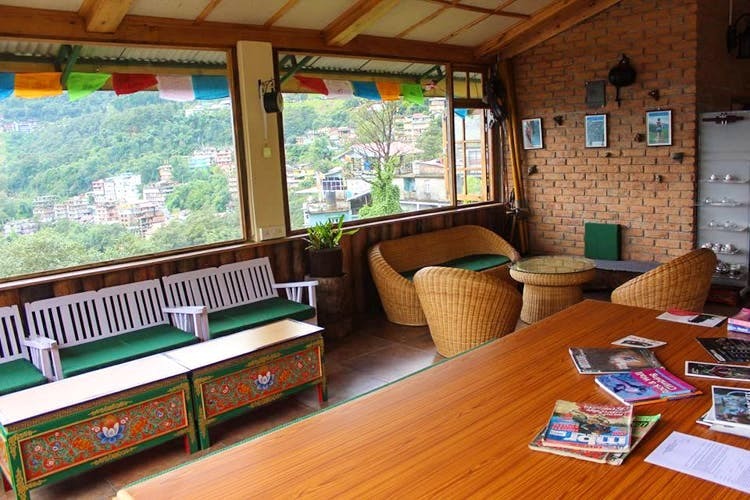 Head out to The Hub homestay in Sikkim for a bit of both. The Hub is a homestay that is essentially an extension of an adventure sports company. It has the perfect location, about four kilometres from the hustle and bustle of Gangtok town in a serene semi-urban environment that gives you a peek into local life. It is located on the route that serves as an access point to northern part of the state, with mesmerising views of Mt Kanchenjunga and Gonjang monastery at a walking distance.The rooms are cosy, with floral patterned curtains - each with a adventure sport motif such as mountain biking, mountaineering and Himalayan paragliding. The food is nourishing and cooked with care - you get to have traditional, homemade organic food with a Sherpa family. Their adventure sports outfit, called Hub Outdoor, is credited with introducing mountain biking in Sikkim. Among the annual events they coordinate is the Epic 17,000 — a new cross country mountain bike endurance race which sees contestants riding their bikes through brutal terrain from 9,100 feet all the way up to the glacial freshwater lake, Gurudongmar, over a span of just two days. Only fit and experienced cyclists can do that race, but they have something for everyone. Whether it is a weekend ride you’re looking for, a week-long camp and ride expedition, they will organise something for you. If a rigorous trail ride isn't your idea of fun, you can opt for a day-long ride and discover Sikkim on a cycle.